ROCK FALLS, Ill. James Samuel Page, 97, of Rock Falls, formerly of Nortonville, Kansas, died Friday, April 12, 2019, at St. Margarets Hospital, Spring Valley, Illinois. Funeral services will be 11 a.m. on Saturday, April 20th, 2019 at the OTrimble Chapel, 329 Main St. Nortonville. Burial will follow in the Nortonville Cemetery. The family will receive friends one prior to services at the funeral home. Memorial contributions are suggested to the Disabled American Veterans and may be sent in care of the funeral home. James was born on Aug. 17, 1921, in Atchison County, Kansas, the son of Charles and Emma (Davidson) Page. He graduated from Atchison County Community High School in 1939. Mr. Page served in the United States Army during World War II, in the 91st Infantry, serving in North Africa and Italy. After returning home he continued farming in the Nortonville Community. He had attended the Nortonville Christian Church, before moving to Illinois in 1984. 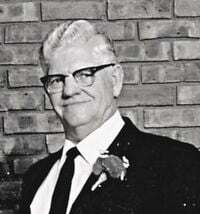 He was a member of the Moose Lodge in Rock Falls, and enjoyed traveling, attending old thrasher and tractor shows. He was married to Mary Eylar on Aug. 8, 1945, they were later divorced. He later married Clare Novak on April 14, 1987, they were later divorced. Survivors include: three sons, Kenneth Page, Chino Valley, Arizona, Charles (Chrissy) Page, Phoenix, Arizona, and Gary (Cheryl) Page, Nortonville; and one daughter, Patricia Smith, LaGrange, Georgia; a sister, Dorothy Alderman, Littleton, Colorado; six grandchildren; and two great grandchildren. His parents; and two sisters, Elizabeth Dimick and Evelyn Lynn; and one grandson, Trent Dedmon preceded him in death. As published in the Atchison Globe.